equipped aircraft that are ready to mobilize at a moments notice. We can provide B&W and Color film Imagery as well as Digital Imagery which produces B&W, Color and Color IR Imagery in one flight path. On projects that might be difficult to acquire full ground control services, we will complete the flight using Airborne GPS technology. See www.keystoneaerialsurveys.com for additional details. We do not compete with our clients for surveying services. Most of our clients provide their own ground control for their mapping projects. On the rare occasion when the client needs the ground control provided by us, we contact one of our surveyor clients in the area of the project to provide this service for us. 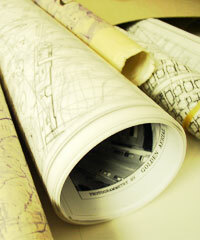 All map production is produced on state of the art mapping systems. We have two 1st order analytical stereo plotters and two, softcopy workstations. Digital ortho photo production is created on the LH Systems Socet set softcopy workstation. Digital output is provided in AutoCAD DWG files, MicroStation DGN files and ArcVIEW GIS ready data. A Certified Photogrammetrist is responsible for all map production which meets or exceeds National Map Accuracy Standards as defined the American Society of Photogrammetry and Remote Sensing (ASPRS). Digital Ortho Photography is produced as the base layer of information which is used in a GIS. 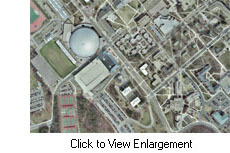 Accurate, scale rectified imagery can be produced in B&W and Color with a pixel resolution of 0.25 foot or larger. This is an excellent tool to use for presentations, development plans showing existing and proposed conditions and the foundation for a GIS. Digital Photogrammetric Mapping and Digital Ortho Photo production is the base layer of information data, used by Municipalities in the development and maintenance of a GIS program. Golden Aerial Surveys has provided this level of support for Cities, Town and Universities with updates being performed on a regularly scheduled basis. Golden Aerial Surveys provides aerial photo interpretation services to clients who need experienced photo interpretation professionals, to help settle disputes between property owners who's activities may have infringed on each other's use of their property. Existing aerial photography dating back 40-50 years is used to identify pre-existing conditions on properties to help settle these disputes.